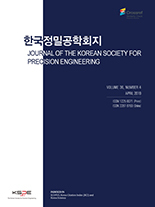 Maolin Jin, Kap-Ho Seo, Jin-Ho Suh,(2019).Research Trends on Disaster Response Robots.한국정밀공학회지,36(4),331-337. With increasing demand for disaster response robots, many governments projects have been launched to ensure safety for citizens. This paper reviews government policies and research trends on disaster response robots. To give a bird"s eye view on disaster response robots, we first reviewed foreign technologies. We then introduced recent technologies developed in Korea and some ongoing researches on disaster response robots.